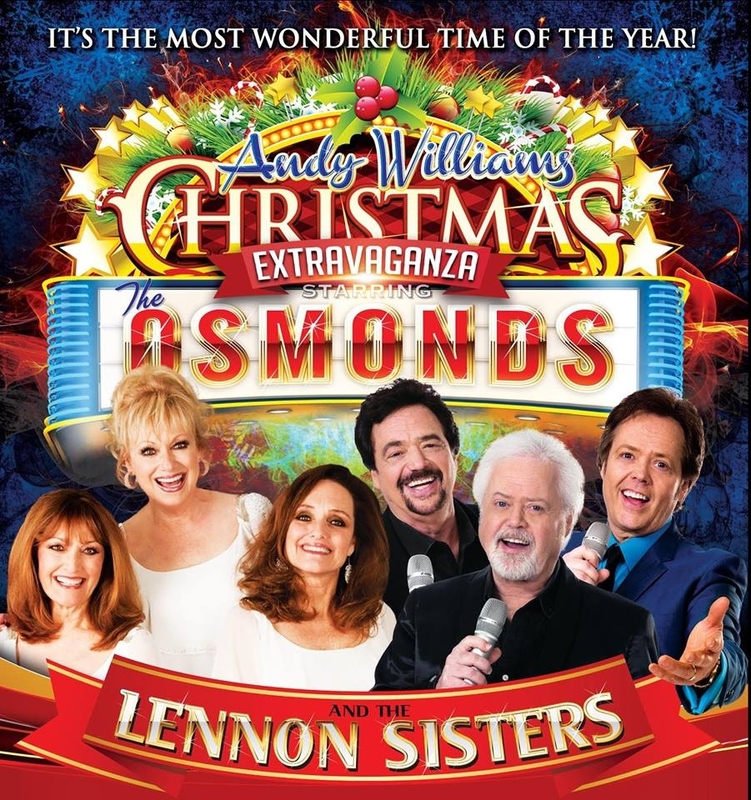 The Osmonds & Lennon Sisters Christmas Variety Show at the Andy Williams Moon River Theater is one of Christmas shows in Branson where you can truly feel the spirit of the holiday season. This limited engagement show runs from November 19 through December 16, 2017 from Monday through Saturday at 8 pm. This Christmas extravaganza gives tribute to Andy Williams, known by many in this entertainment capital as Mr Christmas. This full production show features majestic dancers adorned in festive costumes, real-live reindeer, outstanding performances onstage of your favorite Christmas songs from the entire Moon River Orchestra. As one of the most anticipated Christmas shows in Branson this year, The Andy Williams Christmas Variety Show will take you on a journey back to the extraordinary Christmas specials of Andy Williams from the 60’s and 70’s. As The Osmonds and The Lennon Sisters show up onstage, you’ll see the stage surrounded by twinkling lights, awe-inspiring set of brilliant colors, and all the sights and sounds which show the true meaning of Christmas. Watching Christmas show in Branson is the most wonderful time of the year where you’ll get to enjoy the traditions of old Christmas. People who grew up watching this annual Christmas program on television, may have the chance again to enjoy this treasured Christmas tradition on stage in Branson this holiday season 2017. Everything about the fun side of Christmas, as well as what makes it a sacred season, can be enjoyed in this show. Outstanding singing performances about Christmas with high energy moves are complemented by stunning backdrops, gorgeous costumes, perfect stage props, and great holiday music galore. This meticulously choreographed Christmas show also includes the two most important elements of a real, honest-to-goodness Andy Williams-style holiday celebration featuring The Osmonds and The Lennon Sisters. These two famous singing groups host this limited engagement show, as well as display their unforgettable voices to audiences that haven’t lost a bit of their Christmas magic. This Christmas Variety Show in Branson also features the amazing illusionist Rick Thomas, the Andy Williams Ballroom Champions, and the Lennon granddaughters. There are also a few special critters that will act on stage like penguins and reindeer and, of course, the incredible music provided by the Moon River Band. Andy Williams Moon River Theater is such a stunning venue to host the Christmas Show in Branson. Now housing the Andy Williams Performing Arts Center, the Moon River Theater was constructed to fit naturally into the area topography. The spacious 48,000 square foot theater was designed to honor the integrity of the people in the Ozarks. The theater is set in a beautiful location and surrounded by trees, rock formations, waterfalls, and a stream. Everyone who passes by on Branson’s famous Strip, will certainly notice the beautiful design of the Moon River Theater. So, if you want to feel the true spirit of Christmas in Branson, watch the Christmas Extravaganza at the Andy Williams Moon River Theater Starring The Osmonds & The Lennon Sisters.